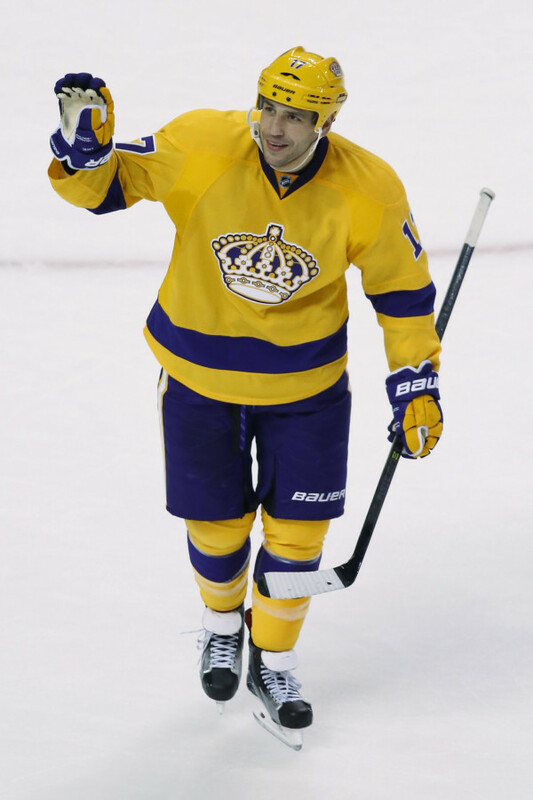 Los Angeles Kings left wing Milan Lucic (17) waves to the Boston crowd after the Kings defeated the Bruins 9-2 Tuesday night at TD Garden in Boston. BOSTON — Milan Lucic scored a goal and an assist in his first return to Boston as the Los Angeles Kings beat the Bruins 9-2 Tuesday night at TD Garden. Lucic, who was traded June 26 after nine seasons in Boston, picked up an assist during the Kings’ four-goal second period and added one of his own early in the third to make for a very happy return. Lucic skated around the ice following the game to a standing ovation from the crowd that remained to honor the Bruins’ former fan favorite. The Pacific Division-leading Kings continued an up-and-down stretch of games in which they’ve gone 3-4-0 over the last seven. Boston suffered its 14th loss at home, and missed out on a chance to vault past Tampa Bay for second in the Atlantic. Jonathan Quick made 35 saves for the Kings, while Tuukka Rask and Jonas Gustavsson combined for 48 in the Bruin net. Nine Los Angeles players had goals in the blowout, and nine had multi-point games. Brad Marchand scored his 10th goal in as many games to put the Bruins up early, cashing in on a rebound at the 5:03 mark of the first. After Marchand was called for slashing late in the period, Jeff Carter tied it on the power play, the beneficiary of a crazy bounce off Bruin defenseman Kevan Miller’s stick with 1:39 remaining. The Kings took the lead when the Bruin defense fell apart behind Rask’s net, allowing center Vincent Lecavalier to hit a wide-open Marian Gaborik for his third in five games, all of which were go-ahead goals. A mostly even first period gave way to a blowout quickly in the second. Andy Andreoff made it 3-1 Los Angeles 2:43 into the frame, and Drew Doughty, Dwight King and Trevor Lewis all scored in the final eight minutes of the period to give the Kings a 6-1 lead after 40 minutes. Doughty, who assisted on Carter’s goal, notched his 300th career point with his goal at 12:09 of the second, taking a Lucic rebound and banking it off of Rask. Rask departed the game after allowing five goals on 32 shots over the first 32:29. He was relieved by Jonas Gustavsson in his first action since leaving the Bruins’ loss to Anaheim on Jan. 26 after showing an elevated heart rate in the first period. Gustavsson gave up the Kings’ sixth goal, to Lewis. Lucic scored the Kings’ seventh goal with a tap-in on a pass from center Anze Kopitar early in the third, marking the most goals Los Angeles scored and the most Boston has allowed all year. Bruin left winger Tyler Randell found the net for the first time since Dec. 5, but Los Angeles defenseman Luke Schenn followed up with the eighth of the night for the Kings, and right winger Dustin Brown added a ninth in the final minutes. NOTES: In a Players’ Tribune article posted Feb. 8, Lucic reflected on his time in Boston, recalling that as a rookie he wasn’t aware the team’s traveling secretary was Bruin legend Johnny Bucyk. … Tuesday’s game was the Bruins’ last at home until Feb. 22. They begin their longest road trip of the year, six games in 10 days, when they visit Winnipeg on Feb. 11. … Bruins RW Loui Eriksson entered the game two goals short of 200 for his career. … Kings RW Tyler Toffoli played in his 200th game. The 47th overall pick in the 2010 NHL Draft has played his entire career with Los Angeles. … Bruins LW Tyler Randell was inserted into the fourth line after 12 straight scratches, replacing LW Zac Rinaldo who was scratched for the second time in five games. … Kings LW Tanner Pearson was scratched for the first time this season.